Garden sage or simply sage (Salvia officinalis) is a famous medicinal herb found throughout the Mediterranean region as well as in the Balkans. The outstanding healing properties of the herb have been well-known since ancient Roman times when it was used to alleviate asthma, indigestion and treat various respiratory tract and skin infections. More recent research has found sage to be an excellent tonic and energizer, effects it owes to its outstanding nutritional profile. Eating sage is great for bone health, blood coagulation and immunity. It supports bone, muscle and nerve health and digestion. In addition to this, its extremely high iron content makes it an ideal food for those of you dealing with anemia as a result of iron deficiency. Also, it would appear that regular consumption promote brain health, supports and favors cognitive performance. There are numerous sage varieties differing greatly in leaf and flower appearance and, of course, nutritional value. Today we are tackling the health benefits of the common garden sage, simply known as sage (Salvia officinalis). Other names for this variety include true sage, broadleaf sage and kitchen sage and are illustrative of the great nutritional and culinary value of this herb. Garden sage usually has lavender, purple or red flowers, while other varieties may be white, yellow or pink. The herb is quite popular in British, American, Italian and other Central and South-East European cuisines. Popular recipes pair the herb with pork and chitterlings. Deep-fried sage leaves make a good snack on their own, but also go extremely well with duck and veal. Italian cuisine promotes a savory combination of sage leaves, olive oil and pasta. Dried sage leaves are used as a condiment, usually for pork and lamb. Fresh sage leaves go well with cheese and give exquisite flavor to salads such as mozzarella tomato salads. You can even add a few freshly-cut sage leaves to your omelette or risotto. What does sage taste like? The herb has a strong, woody, slightly pungent or bitter flavor which it preserves even after cooking it for longer periods of time. Its particular flavor makes it go well with heavier, counteracting their fattiness and giving them a refreshing aroma. Health benefits. Sage owes its intense flavor to a combination of essential oils, natural chemical compounds responsible for the herb’s aroma. The main biologically active components in garden sage are alpha-thujone and beta-thujone, two ketones responsible for the aromatic intensity of the herb. Although studies show that the ingestion of high amounts of pure thujone may damage brain, liver and kidney activity, the small amounts of the herb used to flavor food are safe for consumption. 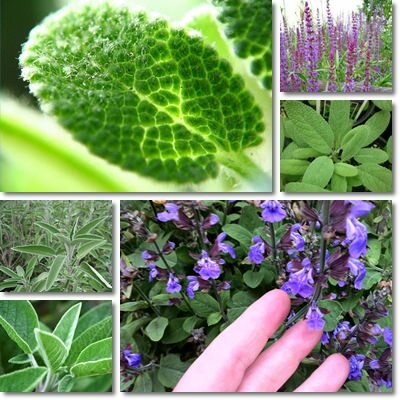 The thujone in sage appears to stimulate the immune system, enhancing its response to bacteria and infections. Moreover, thujone together with serotonin improve concentration, attention and overall cognition, which is why sage consumption, usually in herbal teas, is recommended for adolescents and adults undergoing intense intellectual activity. Sage oil is also safe for use (external only), but there is also the possibility certain people may be allergic or sensitive to various aromatic compounds in it. Other aromatic compounds present in the leaves of the plant include: cineol, borneol, tannic acid, carnosic acid, fumaric acid, chlorogenic acid, caffeic acid, nicotinic acid, nicotinamide, flavones and estrogen-like compounds. Tannic acid in the leaves helps in the treatment of diarrhea and skin rashes and is an active ingredient in cough and allergy medication. Carnosic acid gives sage leaves their powerful antioxidant and anticancer properties, being especially efficient in protecting the skin against UV radiation. Nicotinamide is a potent anti-inflammatory. The herb owes its potent antioxidant, anti-inflammatory, antiseptic, anti-fungal and anti-allergenic properties to the above mentioned compounds. If you take a look at the nutrition table above, you will see that sage boasts impressive tonic properties due to the extremely high amounts of vitamins and minerals it contains. The herb is a great provider of B vitamins such as folate (63%), niacin (35%), pyridoxine (206%), ribiflavin (26%) and thiamine (68%). Its high pyridoxine (vitamin B6) content efficiently reduces inflammation and supports the good functioning of the immune system. In addition to this, sage contain 196% of the RDA of vitamin A, a powerful antioxidant-vitamin, essential for retina health. Vitamin A deficiency can cause symptoms such as recurrent ear or urinary tract infections. Sage contains good amounts of vitamins C and E, two potent antioxidants, efficient in preventing wrinkles, saggy skin and even skin cancers. Moreover, vitamin C reduces inflammation levels associated with chronic disease such as diabetes, cardiovascular disease and cancer. 100 g of sage provides 1429% of the RDA of vitamin K. In combination with a high calcium content, the herb is a great food for strong bones and teeth and regular consumption can prevent osteoporosis development. Rich in magnesium, it promotes cardiovascular and muscle health. Having a good potassium content, sage contributes to regulating blood pressure, fluid balance as well as helps the body recover from dehydration following prolonged episodes of diarrhea. You can read more information on the benefits of vitamins and minerals, including the best food sources on the vitamins and minerals page. Conclusion. Overall, sage is one of the most nutritious herbs, rich in vitamins, minerals and antioxidants. You can either enjoy it as a side dish to mashed potatoes or pork, add it to risotto, macaroni and cheese, summer salads or casseroles or use it to flavor pork, veal or a fancy cheese plate. Whatever you do, you can’t go wrong with sage. It’s plain healthy.